Google Social Search is rolling out, a new service from Google that allows you to easily find material written by people you know and trust. It’s a pretty cool idea, especially in that it’s pretty painless to get started using it. The service will be available through Google Labs Experimental later today. Below, a look at the service. NOTE (January 2010): This service is no longer experimental and now offered to all Google users. Google Social Search Goes Live, Adds New Features explains what’s new in addition to what’s described below. Let’s first talk about what Social Search is not, to avoid confusion, especially after all the seemingly related news that’s come out recently. Last Wednesday, Bing announced a deal with Twitter to produce Bing Twitter Search (see Up Close With Bing’s Twitter Search Engine). 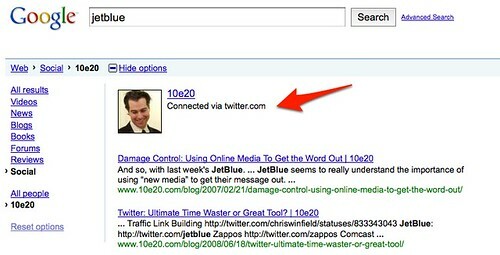 The new service allows you to search for matching tweets or find interesting links that have been tweeted. That same day, Google announced that it also had a deal with Twitter to tap into Twitter’s information and make use of it in some way. Potentially, it might produce a Twitter search engine of its own or make a broader real time search engine. Also that day, Google announced that “Google Social Search” would be coming. This was in development before the Twitter deal was announced and, in fact, doesn’t depend on it at all. Social search doesn’t search against tweets, as I’ll explain. Our Google Social Search Is Coming & More On Google-Twitter article provides further background on those two separate announcements that Google made last week. What Is Real Time Search? Definitions & Players also provides background on the area of real time search, for those that are interested. But the important thing is…. That’s not bad, by the way. In fact, Google Social Search is pretty cool. It’s just important that it doesn’t get confused with a completely different type of search engine. So what is Google Social Search? It’s a way that Google figures out people you trust, then ensures that you see content from them showing up in your search results. The first two have privacy concerns, among other issues. The last two especially involved work. You’ve got to actively chose to share results or actively define a set of sites you want to search against. Who wants to do all this? With Google Social Search, there’s still some work required. But it’s minimal if you already make use of Twitter, Flickr or an existing public social network. 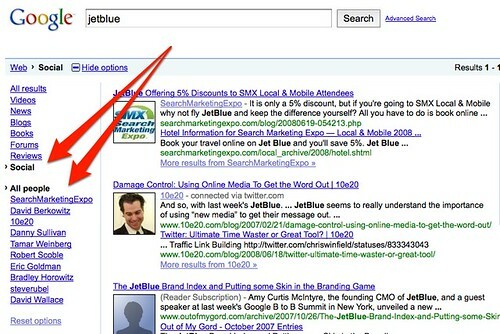 Heck, if you use Gmail or Google Reader, you may already be social search ready. Let’s look at how social search actually works in terms of listings, then we’ll spin back to examine what happens under the hood. These results appeared at the bottom of the search page, in their own section, with the heading “Results from people in your social circle for newport beach” as the first arrow highlights. Underneath that are some results from people I’m connected with socially. The first is myself, my own blog is listed. That makes sense, in a way. I know myself, and I write about Newport Beach a lot. The second result is from Thomas Hawk. The second arrow highlights why Google is showing this. It sees that Thomas and I are connected through Flickr, that we’re mutual contacts there. 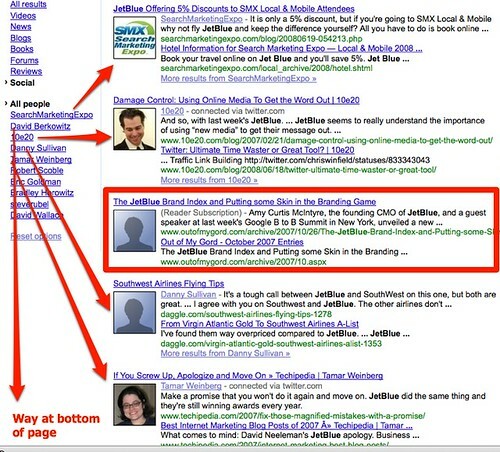 The second results also highlights something Google touts about social search. You won’t always get these results showing up, but when you do, Google feels they’ll be pretty interesting to you. In this case, it was. I had no idea that Thomas had such a nice collection of Newport Beach photos. Notice how the first arrow points to “Social” in the Google Search Options area. This tells you that “social” results are showing, versus video results, blog results, news results or other times that search options can show (see Up Close With Google Search Options for more about the entire search options area and how it works). That drilldown shows me content from Eric Goldman related to “jetblue,” and the arrow tells me I’m connected to him through Gmail. This drilldown shows content from David Wallace and that I’m connected to him through Digg. You see that 10e20 has two posts (and that I’m connected with them via Twitter). See the boxed result? There’s no corresponding person for that listing. This is because it’s a match drawn out of my Google Reader account (see how it says “Reader Subscription) in the listing?). Also notice that people are listed on the left roughly in the same order as their actual posts are shown. That’s supposed to be how it works, but there are bugs that sometimes mess this up. That’s why “David Berkowitz” is listed second in the people column but his actual post in the results doesn’t appear until the bottom of the page. Google told me they’re working on this. Finally, the people you see listed for one query will change if you do another. That’s because the people shown depends on which pages Google decides are relevant for a specific query, which raises the issue of how things are ranked. So what comes first in social search? Google says its using its normal ranking algorithm to pick content, so factors such as the number of people linking to a page, the quality of links to that page, the content of the page itself and so on all can have a factor. Down the line, presumably Google could do more, such as look at the links only between pages authored by those in your social network or by trying to assign an authority score to those you know, based on how closely you seem to be associated with them. But that’s not happening now. By the way, want to use Google Social Search without hoping it just happens to show up at the bottom of your regular results? After you do any search, use the “Show Options” box just under the search box at the top of the search results page. Then select the “Social” link along the left-side of the page. Now you’ve got social search results. One thing I love about the new service is how it makes use of the “social circle” term rather than “social graph,” a phrase more popular in 2007 and 2008 but which doesn’t really explain much to people. Social circle makes sense — these are people you are connected with. They’re in your “circle” of friends. Google Reader is pretty easy to understand. If you subscribe to blogs using Google Reader, Google figures you like or trust content from those blogs, so they effectively become part of your social circle. Google Chat is harder to get your head around. If you have a Gmail account, you have a “Chat” section on the left-hand side of your screen. Anyone you’ve enabled chat for is considered a trusted contact by Google, so they become part of your social circle. But wait, there’s more! Gmail also has a contacts area on the left-hand side of the page, where you can classify people as friends, family or coworkers. Putting someone into one of these categories makes them part of your social circle, as well. But wait, there’s … confusion. Above, I showed an example of how Eric Goldman is part of my social circle through Gmail. The problem is, he’s not one of my chat contacts. I’ve not tagged him in contacts into the friends, family or coworkers categories. He IS a Gmail contact, so in his particular case, that seems to be enough to put him in my social circle. Also keep in mind that if you use a Google Apps account (as I do) for email, chances are, social search won’t tap into your email contacts. That’s because to use social search, you need to be logged in using a Google Account. That Google Account will have a contact list that is separate from your Google Apps contacts. Finally, Google Profiles are used to form your circle. Our Hoping To Improve People Search, Google Launches “Profile Results” article explains how Google Profiles work in more depth. The short story is that if you list a social network you belong to on your profile, Google can use that to effectively import those people into your social circle. For example, on my Google Profile, I list things like my Twitter account, my Flickr account and my Digg account. Google can then look at these accounts and know who my contacts there are. That’s why in the examples above, you can see Google reporting that I was connected to someone through Digg or Twitter and so on. To understand more about how Google can form these connections, see our past article, Mine The Web’s Socially-Tagged Links: Google Social Graph API Launched. One of the nice things with social search is that the privacy issues seem minor. No one but you will see your “friend” results, because those results are expressly tailored to your network. More important, there’s no personal information from your friends being shared. Social search is simply based on figuring how who your friends are and what content they produce, all of which is already in public. Things that aren’t in public don’t show in social search. Right now, Google has no way of discovering who your Facebook friends are or content on Facebook that you’ve authored, if you’ve not somehow made that public. Of course, in order to use the service at all, you have to be logged in. Our Google Search History Expands, Becomes Web History article gets into some of the issues here, although you don’t have to use the web history service itself to use social search. The service is experimental right now, so expect bugs, if you use it. One of the biggest issues I have with it is that you can’t see everyone Google has decided is part of your social circle. I wanted a social circle page to show me everyone. What if I want to remove someone? Or add someone? That’s something Google told me they’re considering for the future. I also found odd things, such as when I did a search on “SEO,” I didn’t get matches from Matt Cutts, even though I know he’s part of my social network and writes much on that topic. A search on FriendFeed didn’t bring up Robert Scoble, who I’m connected to and who has written extensively on the topic. A feature allowing you to pick a particular person and search just for content from them would be pretty nice. Also, often images of people or logos don’t show alongside their listings. Google’s aware of this, I was told, and it’s another bug they’re working on.